The area of today’s Krakow Old Town (in Polish Stare Miasto) actually mirrors the territories of the town of Krakow from the Middle Ages until the end of 18th century. History of the Krakow Old Town begins in the 9th century and leaves an important mark in the origins of Polish statehood. The oldest part of the Old Town was Okol borough, settlement of the powerful tribe of the Lesser Poland (Malopolska) called Vistulans. It was located at the foot of the Wawel Hill, around today’s Kanonicza and Grodzka Streets. It was surrounded by an enormous oak palisade and by one of Vistula River arms. At that time, all of today’s Krakow Old Town probably comprised of several small islands separated from each other either by mounts or river arms. 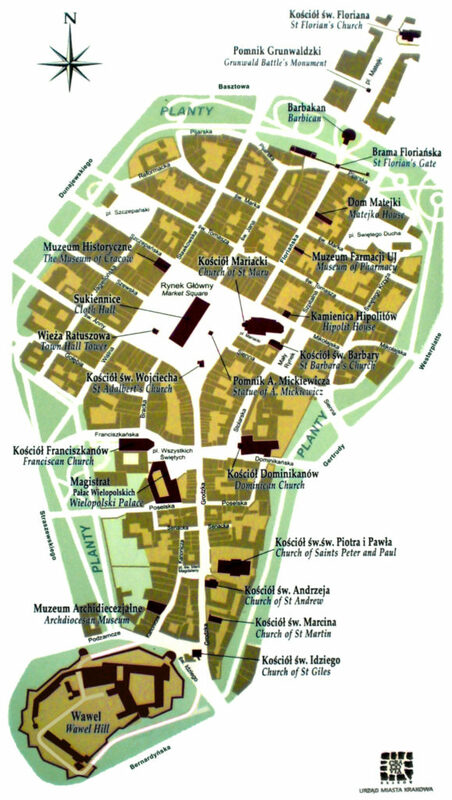 Traces of the oldest settlements were also found under today’s St. Adalbert Church and at the Wawel Hill. In 1038, Castle on the Wawel Hill became the royal residence. By that time, Okol and other neighbouring settlements were already vibrant trade hubs, but it was an impulse for further development. The new chapter in the history of Krakow Old Town began in 1257 with granting of the Magdeburg rights. The Main Square was established and streets charted. From that moment on, Krakow was one of the major medieval European cities, not just a trade hub. Krakow Main Square was the largest of all medieval market squares in Europe. Fortifications arouse around the city and the Okol borough was gradually transforming into a part of the city, connecting the Old Town with the Castle. The city flourished under the reign of king Casimir III the Great. His times are considered to be the golden era of Polish position in the international arena and development. In 1364, the king founded the today’s Jagiellonian University. He also initiated creating the Cloth Hall to push forward commerce in the city. 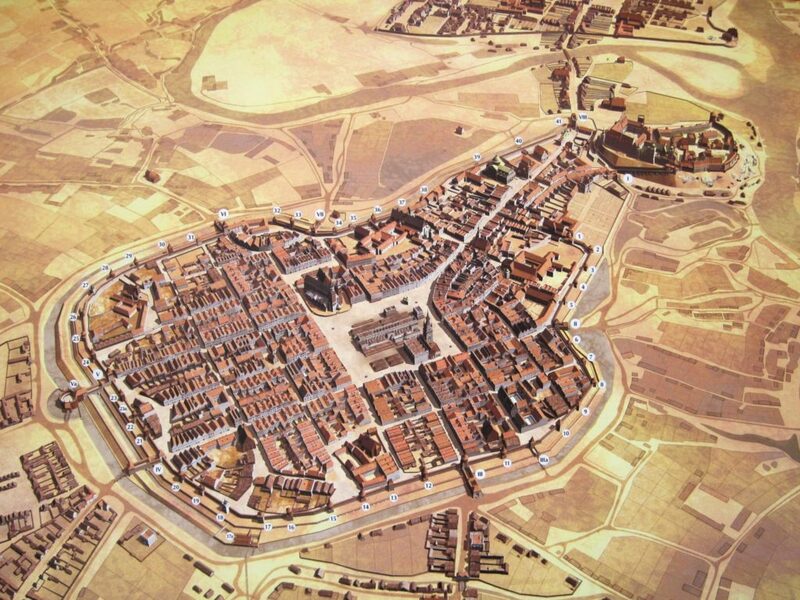 The Old Town saw considerable development during the Renaissance. Polish kings from the new Jagiellon dynasty, Sigismund I the Old and Sigismund II August, initiated intellectual and artistic development of Krakow. It was then when the Wawel Castle was rebuilt in the Renaissance mode and many town palaces were erected. The Royal Road runs through the Old Town. It was a ceremonial route that was used for celebratory parades, coronation marches, and funeral processions. With the death of Sigismund II August, the Jagiellon dynasty came to an end. From then on, Polish monarchs were elected. In 1596 the capital was moved to Warsaw and the political life was subsequently transferred as well. Krakow Old Town remained to be a growing trade hub, and also the academic centre of Poland for the next two centuries. With the partitions of Poland at the end of 18th century, Krakow was incorporated into the Austrian Empire. City’s development stopped and Krakow was turned into a sleepy borderland town under the Austrian rule. 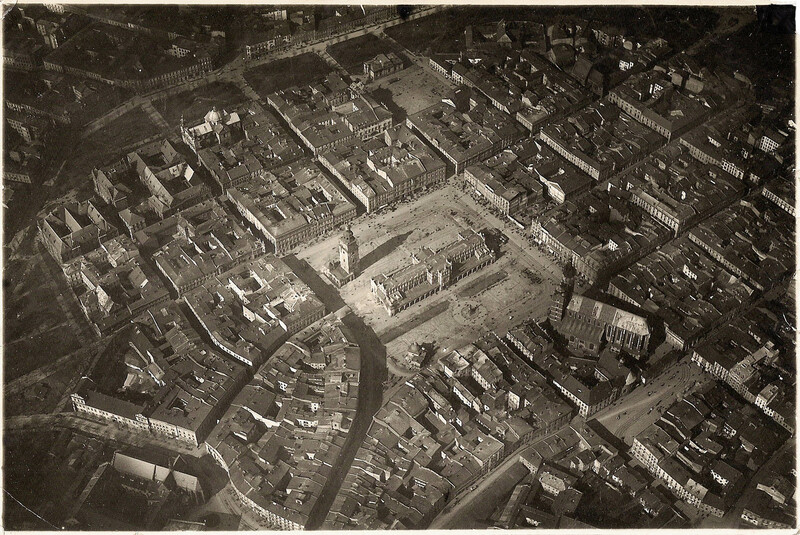 Through the 19th century, the Old Town saw major changes. Fortification was torn down and only one of the medieval city gates, St. Florian’s Gate, was preserved. Instead, on the place of demolished city walls, a ring of parks and gardens, Planty, was created that encircled the Old Town. Most of Krakow’s landmarks are located within the area of the Old Town. 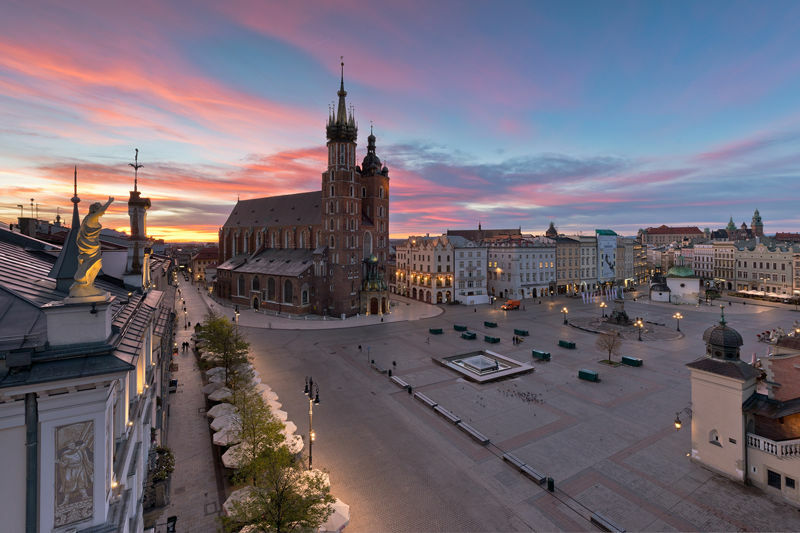 The pearl of it is, of course, the Krakow Main Square. In the very heart of the largest medieval grand square in Europe, stands the Cloth Hall. Its origins date back to 1257 when the square itself was established. At first in form of several wooden stalls, it is now a magnificent Renaissance edifice. It houses the Gallery of 19th-century Polish art on the first floor and the ground floor is occupied today, as it was centuries ago, by stalls offering local souvenirs. Behind the Cloth Hall stands the Town Hall Tower, one the focal points of the Main Square. It is the only remaining part of the Town Hall that once stood there. Today, it houses a branch of the Historical Museum of Krakow. The Main Square is surrounded by beautiful townhouses (in Polish kamienice). The north-eastern corner of the Main Square is occupied by St. Mary’s Basilica. Inside, a masterpiece of Gothic sculpture can be found – the 15th-century wooden altarpiece by Veit Stoss. From the Basilica, runs the most popular street of the Old Town, Florianska Street. It ends with the only remaining medieval city gate, St. Florian’s Gate. It was once connected with the Barbican, an example of advanced fortification solution built in the end of 15th century. Barbican is located already in the Planty Park. This ring of gardens encircles the whole Krakow Old Town. On the opposite to the Barbican side of the Old Town, the Wawel Castle is situated. It is the cradle of Polish statehood. Wawel Cathedral was the main burial site of Polish monarchs. It is also where the “pearl of Renaissance” in Poland is located – the Sigismund Chapel. The Wawel Hill is connected with the Krakow Main Square with the Grodzka Street. Along the way, there are such beautiful landmarks as Church of Saints Peter and Paul and Church of St. Andrew. Before Grodzka Street reaches the Main Square, it runs through All Saints’ Square, where one of the most beautiful Gothic churches in Krakow is located. In the Franscican Church, almost unchanged since the 13th century, magnificent stained glass windows can be admired. Works of one of the most influential Polish artists, Stanislaw Wyspianski, they were installed in the church at the end of 19th century.